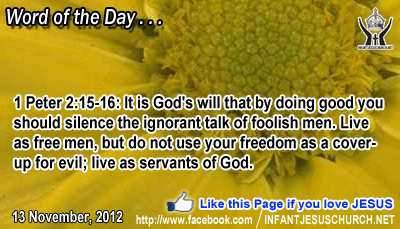 1 Peter 2:15-16: It is God's will that by doing good you should silence the ignorant talk of foolish men. Live as free men, but do not use your freedom as a cover-up for evil; live as servants of God. Heavenly Father, thank you Lord for this new day. Lord you have saved us from sin, law, and death at the cost of your precious Son. We open our heart to you today to say we love you. We want to thank you for this gift of unbelievable redemption. Please accept the actions of our life and the words of my mouth and the thoughts of my mind and the feelings of my heart today as my contribution of thanks. In the name of Infant Jesus, your holy Son, we pray. Amen. 7 "Will any one of you, who has a servant plowing or keeping sheep, say to him when he has come in from the field, `Come at once and sit down at table'? 8 Will he not rather say to him, `Prepare supper for me, and gird yourself and serve me, till I eat and drink; and afterward you shall eat and drink'? 9 Does he thank the servant because he did what was commanded? 10 So you also, when you have done all that is commanded you, say, `We are unworthy servants; we have only done what was our duty. God created us in love for love and he fills our hearts with the unlimited love that gives whatever is good for the sake of another. If we love one another, God live in us and his love is ideal in us. God honors the authentic servant who loves and serves others liberally. He is ever ready to work in and through us for his glory. We must remember, however, that God can never be grateful to us. We have no argues on him. His love requires us to give him our best! And when we have done our finest, we have simply done our duty. We cannot at all outmatch God in doing well and showing love. God loves us without calculate. Does the love of God compel you to give your most excellent? Loving Infant Jesus, fill our heart with love, thankfulness and generosity. Make us a faithful and zealous servant for you. May we liberally pour out our life in loving service for you and for others, just as you have so openhandedly poured yourself out in love for us.